If you have taken any videos in your mobile, iPhone or any other digital devices then, there is chance that your video may not be appearing in a proper manner in your computer. To make it proper manner, we just need to rotate the video screen to 180 degree, 90 degree. Free Video Flip and Rotate is a free software which is used to rotate any video clip to required format. This is really a nice software if you want to rotate video clip. After trying may other software, I stick with this software. – flip video vertically and rotate 90 ° CW. It is having easy user friendly interface, any one can easily understand how to use this software. To Rotate Video using this software, first we need to input the source video clip in “Input File” section. Once we input the source video clip, the screen is split into two screen; Left side screen is the original video clip and right side clip is the rotated clip. If we want to rotate video screen just choose the arrow directions which is available below to that video. The output will be show in right side of the software. To save the rotated video, click on Save Video option. That’s it. 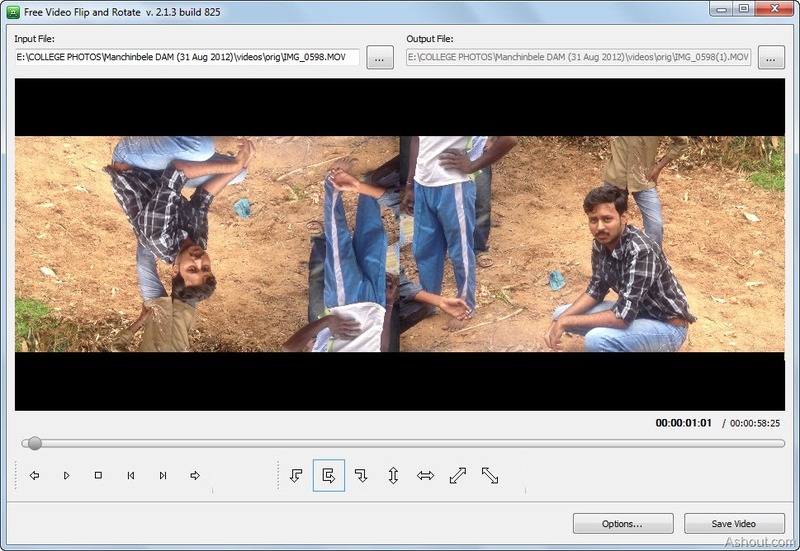 Now you have rotated video clip and saved that output in the same location with another name. This way can easily helps to rotate video of AVCHD, MP4, AVI, MKV, MOV, 3GP, MXF, MPG, VOB, FLV, etc. It can rotate video 90 degrees, 180 degrees, 270 degrees etc.